"I don't know how you guys do it," say our friends. We are permanently exhausted from numerous night-time awakenings; dazed by the constant requests for juice, milk, drawing paper, donuts, TV, chocolate milk, grape juice, more drawing paper, donuts with sprinkles, and Thomas on TV; and at least in my case, ten pounds overweight from eating everything I cooked that our two preschoolers rejected. So when facing the Question of the Week from my virtual support group at Multiples And More, "What are your favorite products for multiples?" I thought it would be fun to reflect on the things that have helped save our sanity for the last 43 months, especially when most of those months were spent on a shoppingly-challenged third-world island and most sanity-saving items had to be ordered online, shipped to Miami, and then brought over by freighter. First product category: Transportation. Baby Trend Double Snap N Go Stroller is simply the best invention for dual-infant transport. You just pop up the frame and snap on your baby-filled carseats. The whole thing folds flat and is easy to stow and travel with. I researched this meticulously while pregnant, and even chose our carseats based on which would fit most easily on the Snap N Go frame. I still consider this my best research project ever. Of course, we did sort of look like a multi-car freight train coming and going. The twins soon graduated to a BOB Revolution Duallie Stroller. Though pricey, it is hands-down the best dual-baby solution for off-roading or jogging (OK, meandering) on sand. But the same sturdy characteristics that made it ideal for rugged island roads also made BOB virtually impossible to fold and lift into a car. BOB Duallies aren't easy to negotiate in airports either, though we did try. Which brings us to the next product category: Travel. With our nomadic life it was good that we had yet another transportation alternative. A shower gift from former colleagues, our lightweight red Peg Perego Aria Twin Stroller was almost like a third child. Before we received official status as Honduran residents, we had to leave the country every 90 days for at least 72 hours. This is a nuisance even without infant twins, but in our case the preparation was downright comical: 1-Delaney; 2-Hayden; 3-Red Stroller; 4-Go. By now, the Red Stroller has logged enough frequent flyer miles to take us on a trip. Another brilliant invention for travel comes from Coverplay. This is a slipcover for pack'n'plays and small hotel cribs. I bought one in brown and pink and one in brown and blue, and never traveled to hotels without them again. So much nicer to know that your baby won't be sucking and drooling on the same metal and mesh as all the other hotel-going babies. Five stars in my book. Next category: Beach Gear. Two products were indispensable for island life with babies. The Sand Toy Back Pack by Spielstabil made carting two of everything (shovel, bucket, watering can, etc) to the beach easy -- just strap one onto each twin and go. 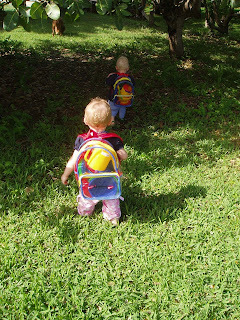 They loved their "bah-paks" and (generally) didn't mind walking the 10 minutes from the house to the beach with their toys on their backs. The second must-have was the Swim Sweater, a perfect combination of toddler flotation device and complete upper-body sun coverage. We loved our swim sweaters. What product did I purchase that I could've done without? Probably the expensive Pottery Barn Kids deluxe diaper bag. It wasn't big enough to shlep all the stuff that two kids required. I hardly used it. Which brings us to the last category of miracle products: Organization. My Big Bag of choice turned out to be a Scout Bagette Tote Bag. On the right is the one that we wore out completely, going back and forth to the beach, and despite being in shreds is still on duty holding costumes from Halloweens' Past. On the left is the one I just replaced it with, now that we are back in the Land of Easy Access. And though I fell out of love with the PB bag, I do count the Pottery Barn personalized laundry baskets as all-time keepers. I ordered these before we went to Roatan, and made sure they came back with us, too, despite leaving most of our New England antiques behind when we sold our property. On the island, they were perfect for toys and stuffed animals. Now that the twins are bigger and capable of chores like making their beds and putting away underwear, the baskets have become key to the daily clean-up routine. They love lifting the lids and throwing their paint-spattered, mud-stained, jelly-stuck clothes inside. Even better, they love reading their names on the outside. "D is for Laney!" says Hayden. But the most important sanity-saver since having twins has not been a product, but a service: Sittercity.com. We actually left the island because we lacked a support system like this. We've found spectacular babysitters in Hartford, Los Angeles, and a few points in between. Need a babysitter? Sittercity helps parents and babysitters to contact each other. We even imported two of our Sittercity nannies four different times to stay with us (not a bad gig, huh?). Thanks Carrie-Ellen and Kelsey... and all the rest of the wonderful friends we've discovered over the last three-and-a-half years who didn't mind holding a baby or two. We couldn't have done it without you. Alecia, I always love reading your blogs! Hope to see you all sometime in Hartford! Welcome back to CT. Can't wait to see you guys. Love all the twins' tips. We are going to need them.